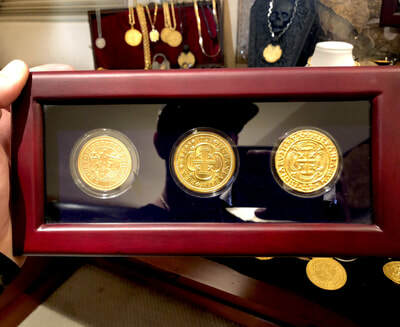 This display box sitting on my desk looks 10,000x better in person than in these photos (The treasure doesn't photograph very well on black will add photos of these coins on white because that's the true beauty you see in person), so if you even like it by these pictures, that couldn't capture the true beauty of this display box, then you will be SO happy when you see them in person! 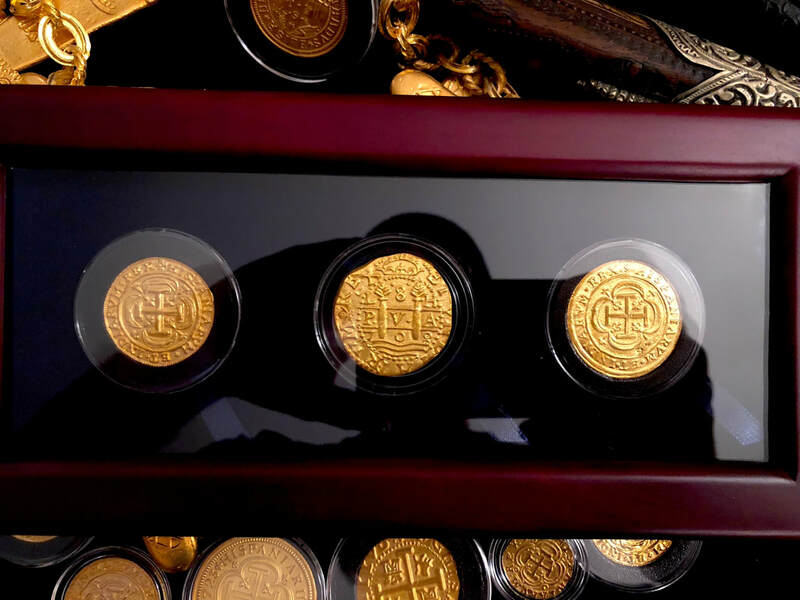 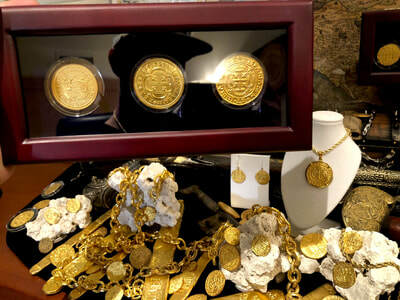 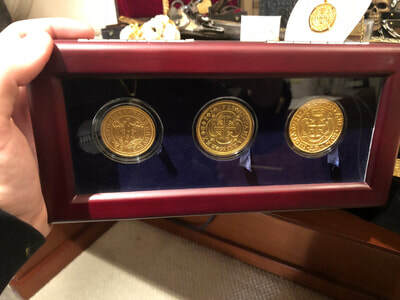 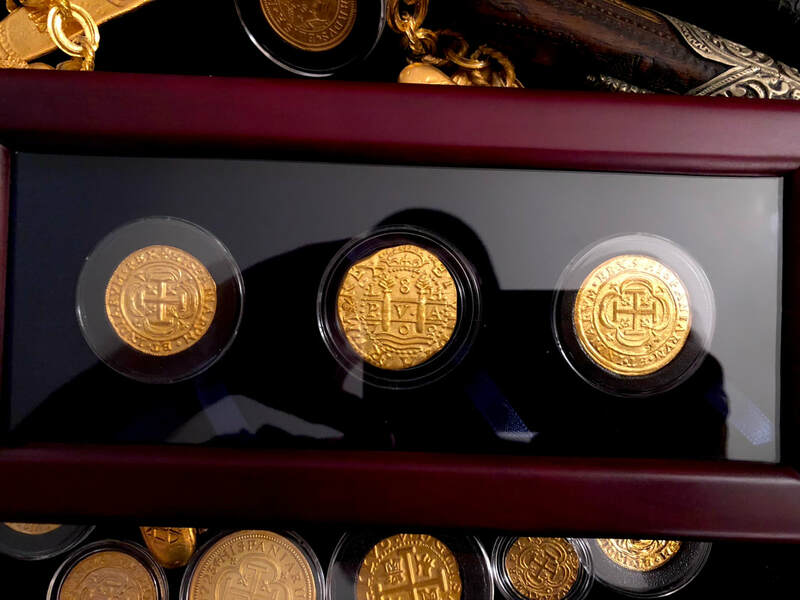 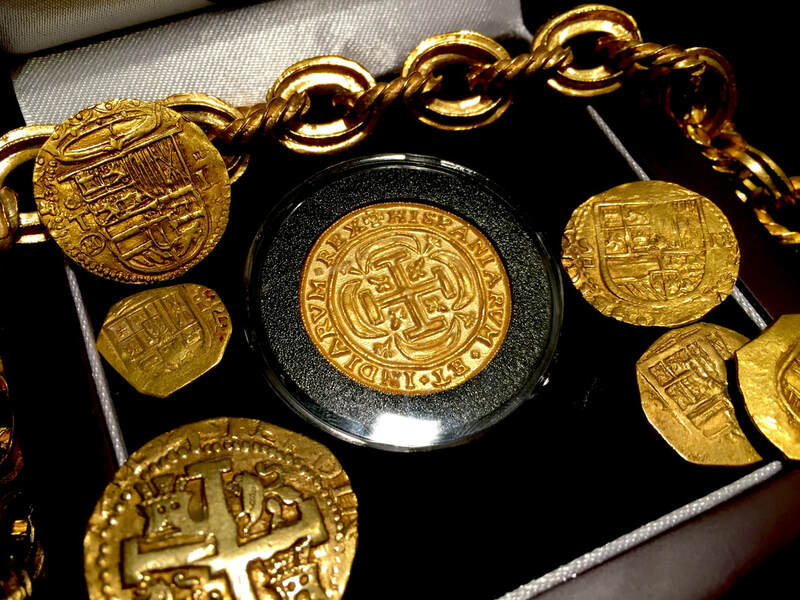 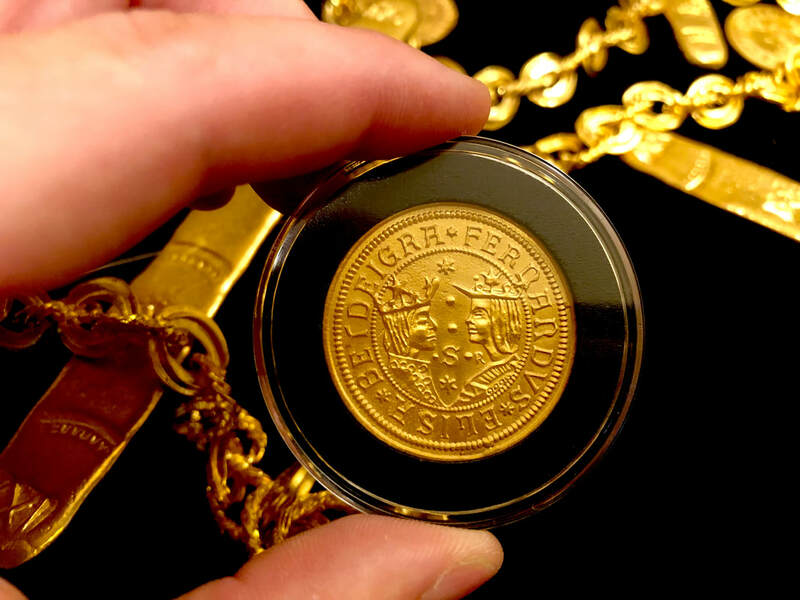 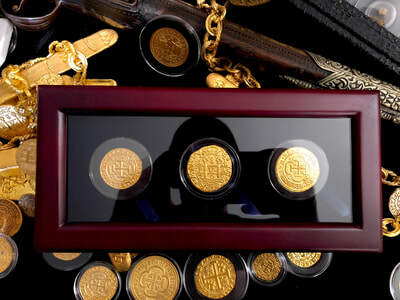 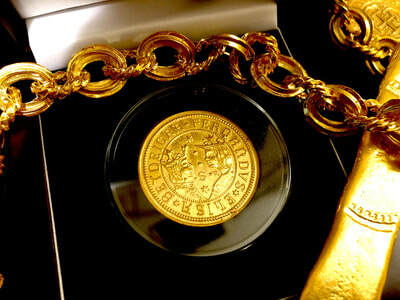 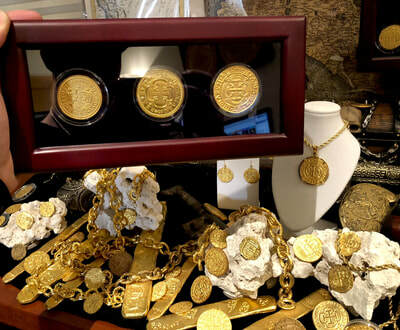 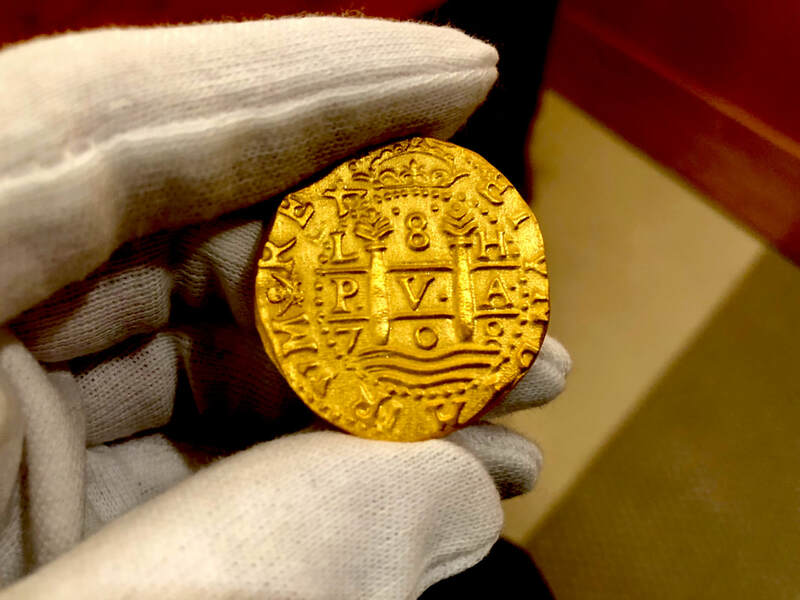 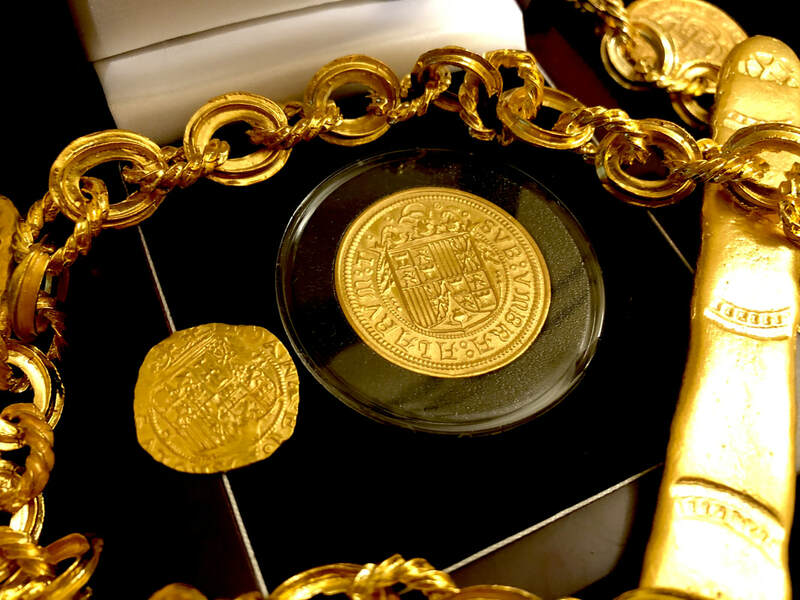 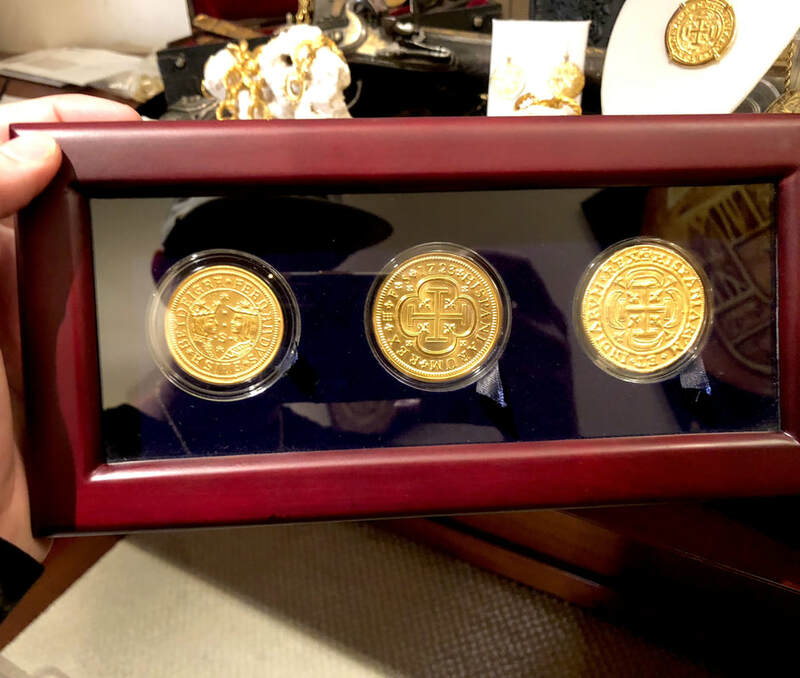 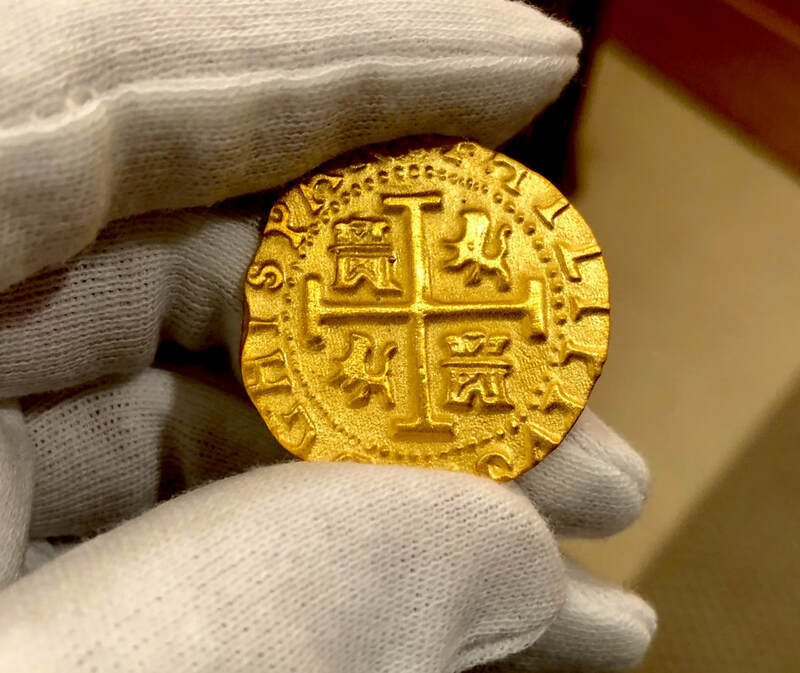 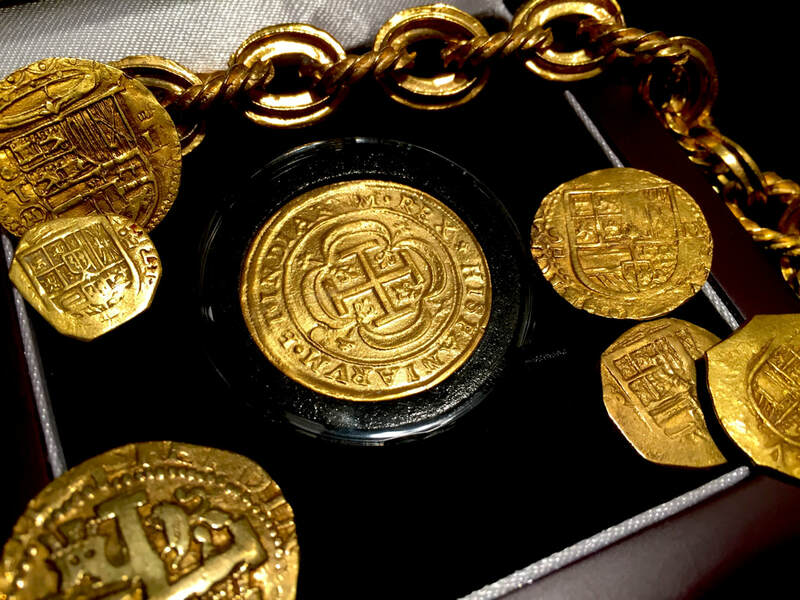 MEXICO 1714 “ROYAL” 8 ESCUDOS 18K GOLD REPLICA DOUBLOON COB SHIPWRECK 1715 This beautiful 24kt GOLD Plated “Replica” is nearly identical from the “original authentic piece that sold in 2008 for $270,000!!! and is would be Great for a Jewelry Pendant Piece as well. * Please remember color can vary with each piece, especially depending on which karat weight of plating you choose. * This piece is large, measuring in at approx. 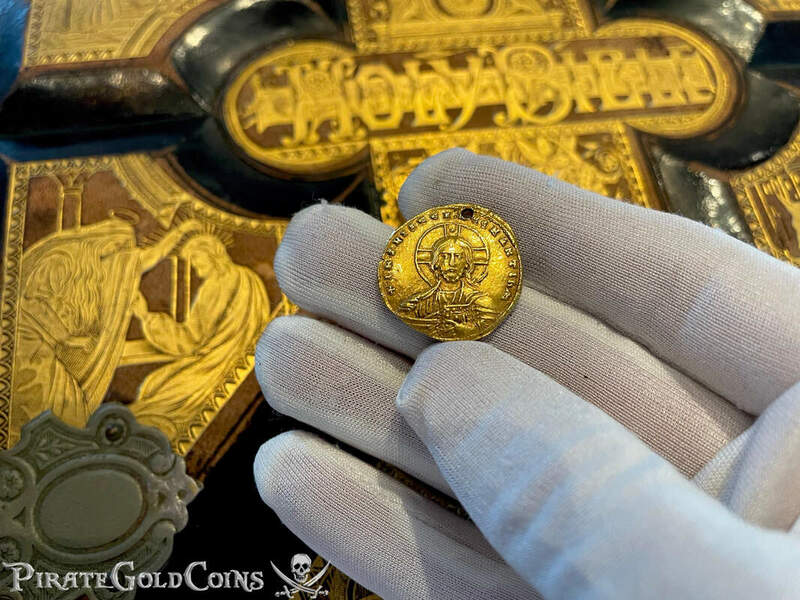 35mm and is just stunning to view all the Details (devices) and weighs approx 13.3g. The CROSS side legends shows: HISPANIRUM.ET.INDIA.REX / The CROWN side shows: PHILIPUS. 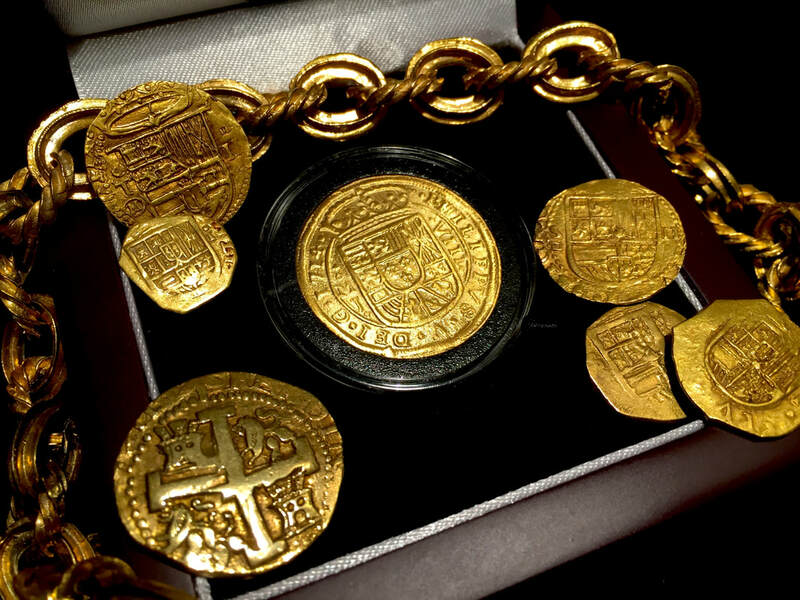 V. DEI.G. 1714 = BY THE GRACE OF GOD KING of SPAIN PHILIP V 1714. 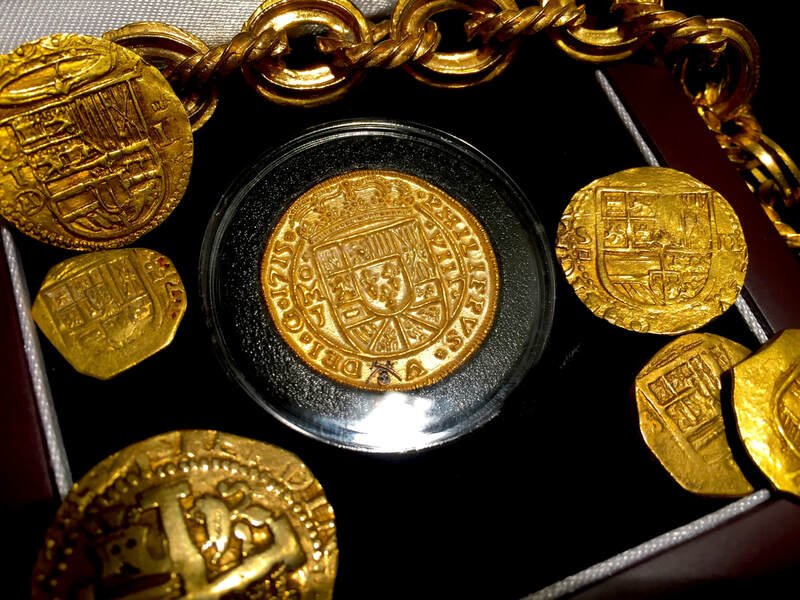 Also on the Crown side shows the Shield with the Denomination to the right VIII (8 Escudos) and oMJ to the left of the Shield (Mint= Mexico, Assayer Jose de Leon). On the Cross side, just below the cross at about 5 o’clock just below the Tressure you’ll see a “C” marking = COPY. 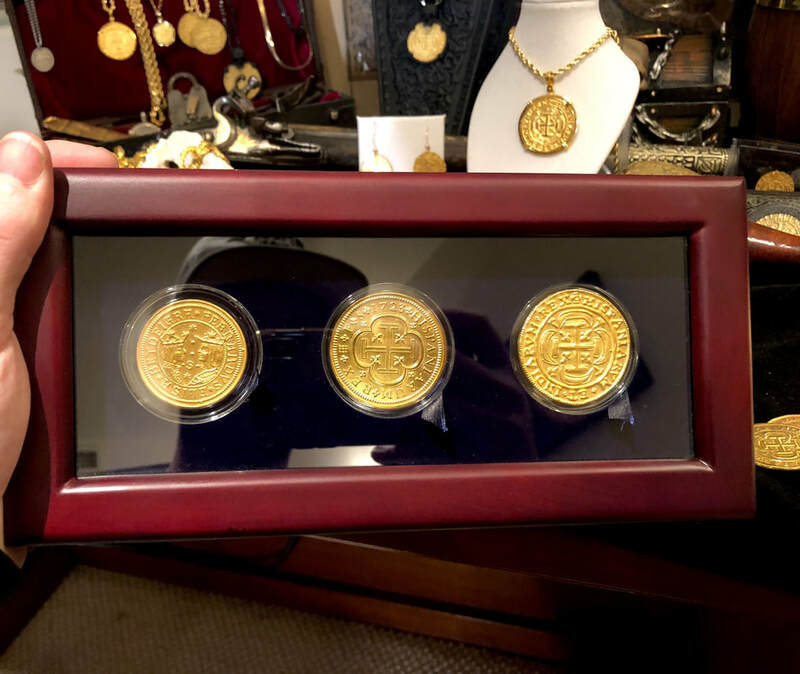 Beautiful 24 karat GOLD ROYAL replica that can also be used as a pendant, if you choose, you can either add a hook at the top (as seen in one of the photos) at your jeweler or we are happy to have it done at our jewelers for you (additional cost). You may also like to have it placed in a Pendant Bezel, which we also offer here as well for an additional cost (contact us for details). **Please keep in mind each piece is HAND MADE, struck, toned and electroplated and the Color and Luster will vary slightly from piece to piece, as each piece is Uniquely struck or poured.